Circuit board fabrication and Assembly are two complex processes that require specialized expertise and equipment. Finley Design Services works with trusted partners to deliver high-quality custom solutions that are designed to meet your company's needs. We provide full support for custom design, layout, fabrication, QC, and assembly for any ATE project. When it comes to circuit fabrication, it's important to choose a manufacturer with a track record of success. We work with the most qualified PCB manufacturing partners who have the technologies to meet the demands of today's ATE industry. Whether you need a simple 4-layer PCB to a complex 44-layer PCB with blind and buried vias and back drilling, we deliver solutions that optimize your test performance. Our team brings together a huge range of fabrication and assembly capabilities. If you have any special requirements, do not hesitate to contact us. We are able to deliver custom solutions for just about any ATE project. 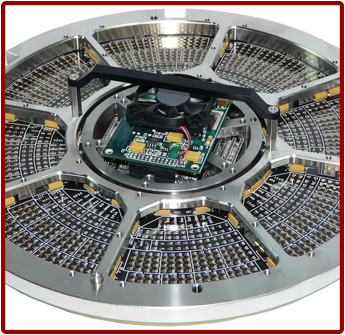 Minimum Dielectric Space Cores of 0.0025" - 0.003"
We have a qualified team of manufacturing technicians that assembles all components by hand. We also maintain an extensive inventory of frequently used parts and components. For each assembly, a Bill of Materials (BOM) is generated from the design. This BOM, along with a set of assembly drawings and notes, is used by the assembly team and is kept for any future reorders and assemblies. This process allows us to track any changes as well as provide our customers with high-quality assembled boards that match their design.